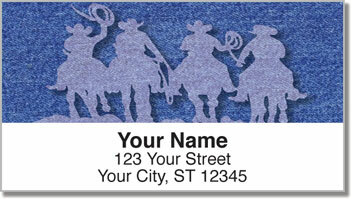 Hold on to your hats, these Western-themed return address labels are about to take you for a wild ride on a bucking bronco! The rodeo is an exciting American tradition feature cowboys and cowgirls who aren't afraid to perform potentially back-breaking stunts in front of a stadium full of astounded fans. 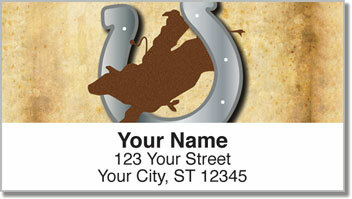 Rodeo Address Labels from CheckAdvantage capture that Wild West spirit with eye-catching illustrations of your favorite events. Stick these labels on your outgoing mail for an extra easy way to prepare letters, packages and more. You can even use this product to mark all sorts of personal property as your own. 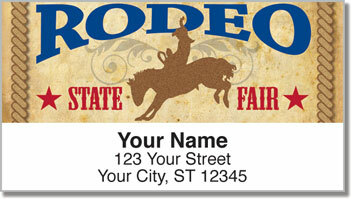 Order Rodeo Address Labels for yourself right now! 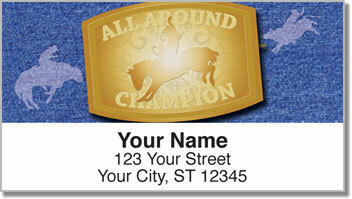 This rough riding design is also available as a set of matching personal checks.